THE ISPCA HAS helped rescue several cats and kittens after 34 of them were found in a seriously ill state in Mitchelstown, Co Cork. 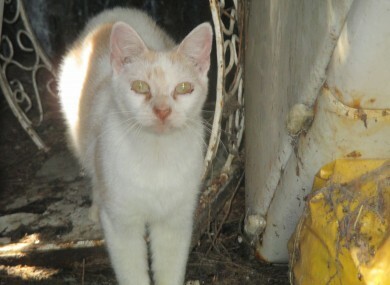 A local group contacted the organisation to assist with rescuing the colony as the cats had severe health issues and there was concern for their welfare. ISPCA inspector Lisa O’Donovan, with assistance from Community Cats Network, humanely trapped the cats and kittens and transported them to the vet. In a statement, the ISPCA said many of the cats were “extremely emaciated” and some were “gravely ill”. “None of the cats were spayed or neutered and inbreeding had also become a serious issue, spreading disease. This was an extraordinary situation and ISPCA intervention was necessary. It is unfortunate that some of the cats had to be humanely euthanised on veterinary advice, as there were serious health issues that could not have been resolved. It was compulsory to return as many healthy, neutered cats as possible to the site to prevent new stray cats re-establishing a colony there. The ISPCA said this case “highlights the need for on-going education on the benefits of spaying and neutering, as well as the need for Trap, Neuter, Return (TNR) projects to assist with colonies of this nature”. This is Feral Cat Awareness Week and the ISPCA is highlighting welfare concerns about feral cats. More information can be read here. Read: FactCheck: Are restricted dog breeds inherently more dangerous than all the rest? Email “34 'gravely ill' cats discovered in Co Cork ”. Feedback on “34 'gravely ill' cats discovered in Co Cork ”.